Born at a time when people assumed desktop computers were all about text, the primarily visual Macintosh is marking its 25th anniversary on a mostly high note with some of its best-ever sales and influence beyond just desktop computers. The design was originally envisioned in the late 1970s by early Apple employee Jef Raskin as a truly accessible computer that didn't require the at times arcane text commands of most computers. Based heavily on ideas from Xerox's PARC research facility, the original Macintosh 128K was formally launched January 24th, 1984 as the first mainstream computer to depend on the concepts of a mouse pointer, a windowed desktop, icons and folders. It wasn't Apple's first system of the kind —the Lisa was launched just over a year earlier —but it was the first to be priced at a level average (if still well-off) people could afford, initially costing $2,495 where the Lisa had been priced four times higher. Most now acknowledge that the design is ultimately the father of the modern computer, though the truth is that the system initially struggled to gain acceptance. Besides a high price well beyond the pure cost, many weren't ready to embrace the notion of a mouse-driven control scheme. The visual interface was not only a radical break that was deemed too simple but was considered a large barrier to developing software. And while Apple co-founder Steve Jobs is often credited with helping guide the original design and backing it as the future of the company he helped create, his increasing conflicts with then-CEO John Sculley forced him out in 1985. Sales of the Mac cooled after the early rush, but climbed upwards again through the second half of the 1980s and built up a reputation for the Mac as a content creation standard in an era when Windows was still considered an inferior parallel and most non-Mac computers had command line interfaces. The era introduced color displays, expandability, hard drives, and even the first notebook in the form of 1989's Macintosh Portable: a 16-pound, $6,500 behemoth whose battery technology was crude enough that people couldn't even run the system on AC if the battery was drained. The original Macintosh 128K desktop. The 1990s were, by contrast, a rollercoaster for the Mac. Although Apple is often touted as pioneering the modern notebook's clamshell design with 1991's PowerBook 100 as well as a mainstream 32-bit operating system in System 7 the same year, the advent of Microsoft's Windows 3.0 and later Windows 95 eventually swung the advantage away from the Mac. Users eventually got a very similar and at times better experience to the Mac from commodity PCs; from 1995 onwards, Windows systems were capable of true multitasking where even Mac OS 9 was limited in terms of how programs could run in the background. Intel's rise throughout the 1990s also eroded at least some of Apple's perceived performance edge, and Apple's tendency towards very high profit margins and an extremely large product range gradually turned many users away from the Mac towards lower-priced and now more capable PCs. Executive management even greenlit Mac clones that were regularly cheaper than Apple's own products. The decline in market share was steep enough that, by the mid-1990s, many observers were convinced Apple was nearing its end. Most already know the story that follows from the company's late 1990s turnaround. 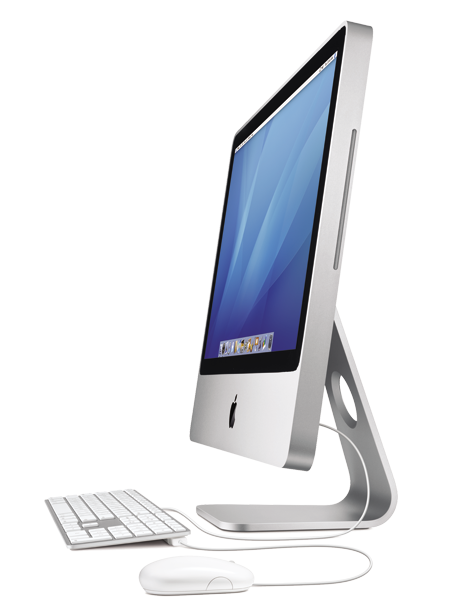 After taking Steve Jobs back on as first its temporary and later permanent new CEO, Apple released the first iMac in 1998 and effectively reversed its fortunes overnight, returning to its roots with a design that sparked renewed interest in genuinely appealing, ergonomic design in computers and for electronics as a whole. 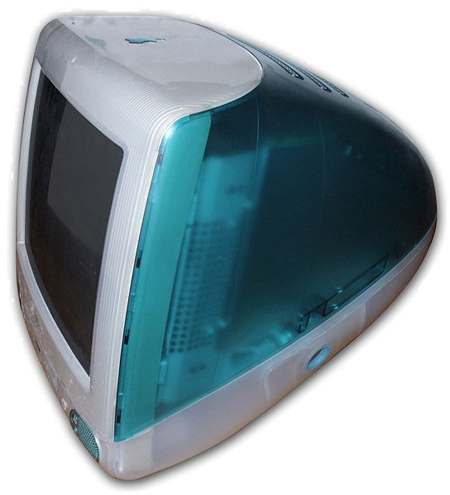 The first iMac from 1998. Since then, Apple has often positioned the Mac as an attractive, premium-priced but easy to use computer and has regularly been the first to popularize certain design or technology trends: while it wasn't first with USB or Wi-Fi, the Cupertino-based company was the first to encourage their use. Thin, widescreen notebooks also owe much of their now ubiquitous popularity to the titanium PowerBook G4 of 2001. Mac OS X's appearance also gave Apple a modern operating system that itself was first with mainstream features like the use of 3D effects, easy built-in device syncing, and widgets for quick access to information. Macs have at times floundered in the early part of the 21st century. The Power Mac G4 Cube, though still cherished as one of the most unique computer designs yet, was quickly stifled as its price and performance trailed behind. And lagging PowerPC development by both IBM and Motorola frequently left Apple struggling to justify performance differences and ultimately pushed the company to switch to Intel processors. 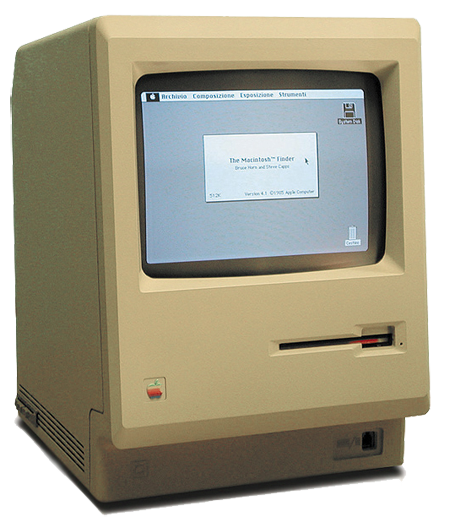 But by now, 25 years after the first model was headed to stores, the Mac is considered at or near its zenith. In the past three years, the platform has steadily climbed back in market share to where it claimed nearly 10 percent of US sales this past summer. Macs are continuing to register significant sales growth even as the PC industry declines in a battered world economy. Apple's systems are still popularly seen as design leaders and, due to the Intel switch, now regularly perform as well or sometimes better than many Windows PCs with similar hardware. Apple has lately positioned the Mac as a true eco-friendly computer with aluminum, glass and energy-efficient processors now almost ubiquitous throughout its lineup. And the Mac is now showing signs of breaking out from the familiar notions of desktops and notebooks. While the interfaces are radically different, the Mac's operating system underpins the Apple TV media hub, the iPhone and the iPod touch, all devices which embrace the philosophy of a simple, visual interface and which (in the case of the iPhone and iPod) are virtually small computers themselves. In characteristic fashion, Apple isn't waxing nostalgic and (as of this writing) has done nothing to commemorate the anniversary of the computer that still defines its business. The company has even gone so far as to pull out of Macworld Expo for 2010 despite the show having been around for almost as many years as the Mac itself. Still, as one of the cornerstones of the PC industry and the reason for AppleInsider's existence, the Mac has and will hopefully continue to have an impact on computers for many years to come. An iMac circa January 2009, 25 years after its first ancestor.